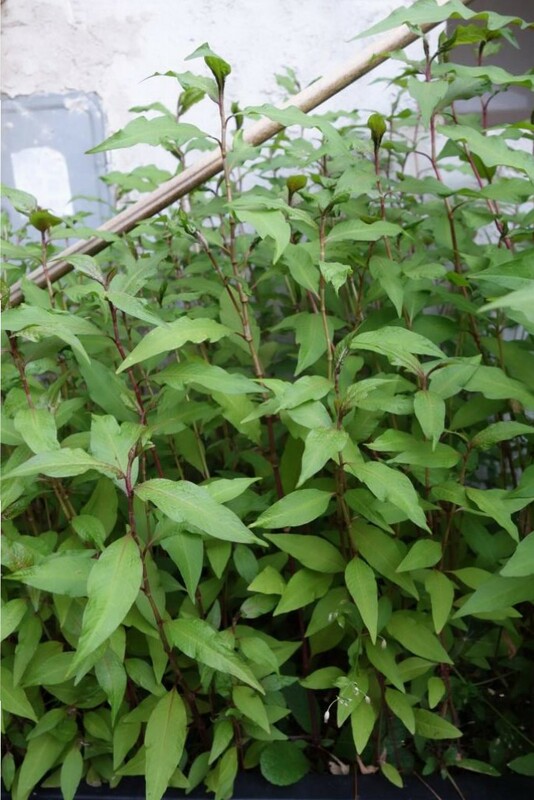 In 2013, I finally went and bought a waterpepper (Polygonum hydropiper) plant again. As always, it arrived in a rather bad state, so I hardly wanted to try anymore. But, it’s just too fascinating a… something: It is definitely an herbaceous plant, and just an annual, like many an herb. It is a native of the Eurasian landmass, to be found relatively widely, but it seems to only be Japanese cuisine that uses it (as azabu-tade). Among plants with spicy-hot characteristics, waterpepper is quite unusual, however. It is a native of temperate rather than tropical climates, it is the leaves that are used, but they are unlike leaves of real peppers in both their smaller size (not usable for wrapping things in them) and their greater effect (making them difficult to use in cooking). The leaves of waterpepper have an effect rather like Sichuan pepper: bite into them, and they soon numb the tongue. That effect lasts even longer here; it’s not that the mouth feels as if it were on fire or vibrating, but rather anesthetized with something that gives an impression of a peppery taste. The plant I had in 2013 eventually would grow into a nice bush – and promptly flowered so late that I thought the seeds couldn’t really have matured sufficiently to be viable, even after I had transferred it inside (rather like what happened with the Ashitaba). A lot of flower petals or seed husks or something fell off the plant as winter progressed and it died off, though. 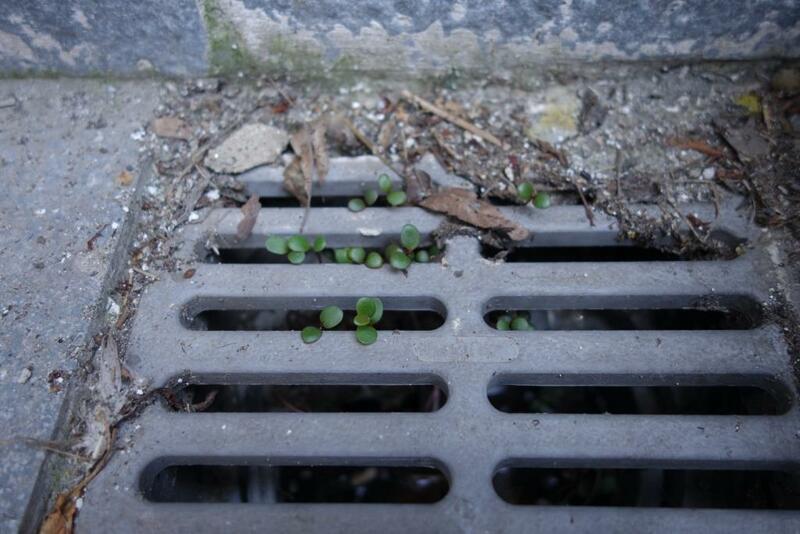 Early in spring, in the planter they had fallen into, lots of seedlings were coming up – and promptly died when they could finally be transferred outside into sunlight. Later in spring, a second batch of seeds came up in that planter, another batch came up in yet another planter, and some more seedlings came up in a few other pots as well as outside, where last year’s plant had stood for most of the time. And they have grew ever since. Good thing, too, for waterpepper is one plant where I’ve found it to be a bad idea to buy a plant from a gardener’s; they are typically too small but already set on flowering when they get sold in spring, whereas plants grown from seed, in place, will develop to considerable size and flower late as they should. This year, 2015, I was hesitant to publish this note about waterpepper as it seems that all these many plants from 2014 had not managed to successfully produce seed (at least, I didn’t notice them) and I feared them all lost. 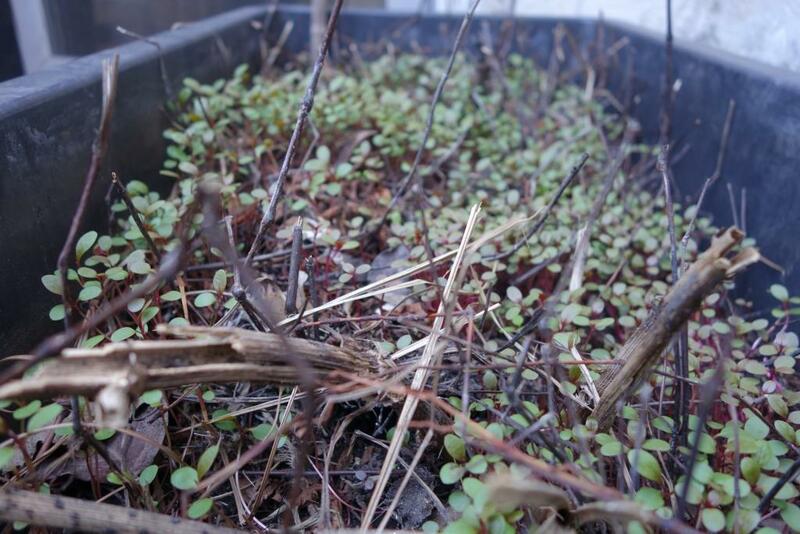 The main planter that had been full of waterpepper had been inundated in water, left outside and frozen over when winter came around; it was stinking brackish water when I finally managed to drain it recently. Well, by now I have once again found waterpepper seedlings in at least three different places; in soil where plants had been last year, in a pot that must have stood close to a plant, and also in that planter I just talked about. Now if only I could find more recipes or at least ideas for how to use this spicy herb. Japanese knows it as azabu-tade and seems to be just about the only cuisine that actually uses it – and once again, it’s the cuisine best known for wanting everything to taste just of itself and as fresh as possible that employs strangely spicy flavorings.